The characters in these nine short stories abandon families, plot assassinations, nurse vendettas, tease, taunt, and terrorize. They retaliate for bad marriages, dream of weddings, and wait decades for lovers. How far will we go to escape to a better dream? What consequences must we face for hope and fantasy? Robin McLean's stories are strange, often disturbing and funny, and as full of foolishness and ugliness as they are of the wisdom and beauty all around us. Robin McLean holds an MFA from UMass Amherst. She teaches at Clark University and lives in Bristol, New Hampshire, and Sunderland, Massachusetts. Robin McLean: Robin McLean was a lawyer and then a potter for 15 years in the woods of Alaska before receiving her MFA at UMass Amherst in Massachusetts. 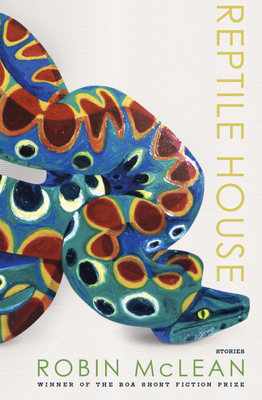 Her first collection Reptile House was a finalist for the Flannery O'Connor Short Story Prize in 2011 and 2012. McLean's stories appear widely in such places as The Nashville Review, The Malahat Review, Gargoyle, and The Common and Copper Nickel, as well as the anthology American Fiction: The Best Unpublished Short Stories by Emerging Writers. A figure skater first--having learned to skate and walk at the same time--McLean believes that crashing on ice prepared her for writing fiction. She currently teaches at Clark University, and splits her time between Newfound Lake in Bristol, New Hampshire, and a 200-year-old farm in western Massachusetts.